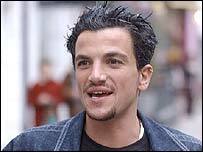 Singer Peter Andre has completed his comeback by topping the UK singles chart with his re-released track Mysterious Girl. Andre fended off the challenge of Jamelia's Thank You, which entered the chart at two, and Westlife's Obvious - which went in at number three. Mysterious Girl originally went to number two in the UK charts in 1996. The success of the re-release follows the singer's appearance on I'm A Celebrity... Get Me Out Of Here! Busted fell from number one to number four with Who's David, while Kelis is at five with Milkshake. Jazz pairing Katie Melua and Jamie Cullum, who performed at the Brit Awards two weeks ago, are still putting in strong showings in the album chart. Melua's Call Off The Search tops the chart, while Cullum's Twentysomething is at number three. Between them is fellow jazz star Norah Jones' Feels Like Home.